This evening saw a huge bit of Mission Impossible news break on the internet. Not only are there two new movies coming in the series, Christopher McQuarrie will returning to direct both films back to back. After the mega-success of this last summer's sequel, MI: Fallout, the studio was extremely quick to jump on bringing more adventures to the cineplex. Of course, Tom Cruise was eager to get the news on Twitter with a brief teaser announcement. 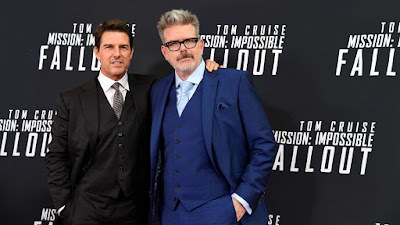 After years of Mission:Impossible movies, Fallout hit during the blockbuster season and completely recharged the franchise by tying up numerous loose ends and seeing closure for many story points. McQuarrie will be handling writing duties on both MI7 and MI8 which look to release in summer 2021 and 2022. Despite fan backlash over Cruise's off screen persona, he continues to deliver the goods with these action flicks. Check out the Twitter post below.